There are two approaches to jewelry design with gemstones. The first process starts with the gem, creating a mounting that complements the shape and unique characteristics of the gemstone. If the gem or pearl is unusual in shape, it is difficult if not impossible to find another one to replicate the design. That is the process I employ in the creation of my pearl animals. Although it is usually difficult to find an exact replacement stone for a mounting made by this method, it is sometimes possible to custom cut a gemstone to fit the same design. Sometimes a portion of the design- say a hand, a face, beak etc.- can be re-used in another piece; or the original mounting can be adjusted or altered to accept a different shape of gemstone. Such works are semi-custom pieces. The new piece is sufficiently unique so as to not be considered a copy. With the second approach the design is conceived first, with a certain size and shape of gemstone in mind. Gems are then selected to suit this mounting. Most mass produced jewelry is made by this second approach. The original master model is made for ‘calibrated’ gemstone sizes and hundreds, if not thousands of identical pieces can be copied. This does not mean that one-of-a-kind pieces cannot be created by this method. Of course the jeweler can always destroy the mold and refrain from duplicating the piece. 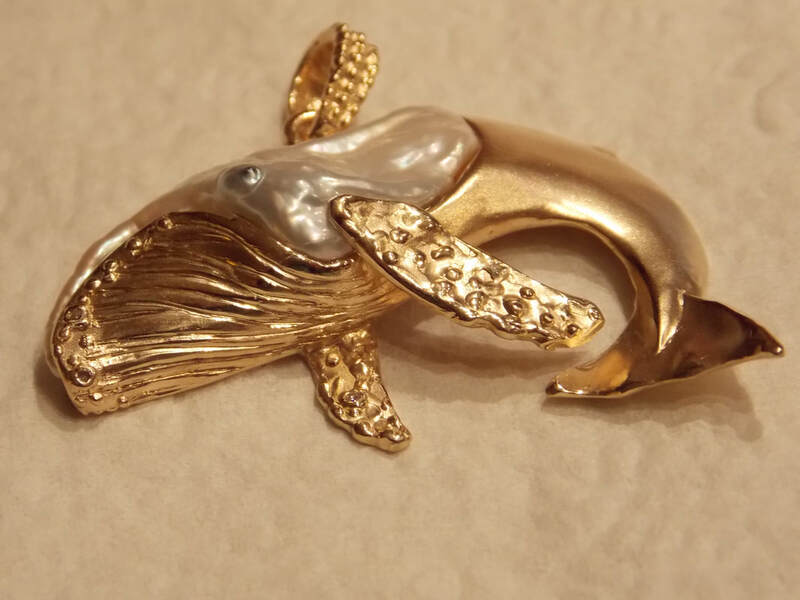 My “Pearl Animals” are truly unique, one-of-a-kind creations. I begin by sorting through thousands of uniquely shaped pearls to find the few that hint at an animal shape. This is an intuitive, playful process. The pearl best suited for one these little custom sculptures does not suggest an animal in its entirety. Just as a lover is most alluring when shrouded in an air of mystery, these pearls also “don’t give it all away on the first date.” They suggest a part of the animal. At their best, these pearls also reflect an aspect of the character of the animal: the fierceness of the wolf, the graceful movement of the dolphin, the playfulness of the otter. The rare pearl is envisioned as part of the final hand crafted design. Both the pearl and the creative design together bring the animal to life. Now the pearl is on my design table. A sketch pad, well-chewed-on pencils and charcoal refine the vision. A good jewelry designer must be able to envision the design in its 3-dimensional glory. 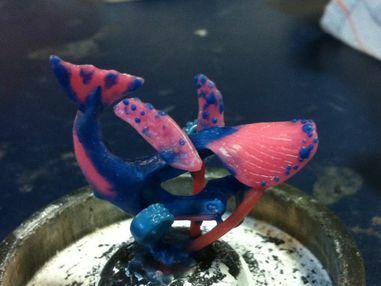 I use the ‘Lost Wax Casting’ process. 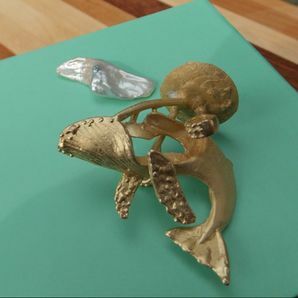 A variety of hard and soft waxes are carved and molded to shape an exact image of the gold or silver setting. This model is encased in plaster. The wax is then vaporized out of the mold using a high temperature kiln. I then cast gold or silver into this mold using a centrifuge. The mold is destroyed by quenching the plaster in water: Voila, a pearl animal is born. But wait: there’s more work to be done. The rough casting has to be finished and refined, textured and polished. Final adjustments are made; I then carefully set the pearl into its gold mounting and bring to life another one-of-a-kind pearl animal.